House Majority Leader Eric Cantor (R., Va.) applauded the passage of a bipartisan Israel resolution that expressed U.S. support for the State of Israel as it defends itself against rocket attacks from Hamas, according to a press release. "Israel is one of our nation’s strongest democratic allies and its security is directly tied to our own," Cantor said. "Hamas' outrageous and unprovoked war against Israel must end. Until Hamas accepts the Quartet principles, abandoning violence and recognizing Israel's right to exist as a Jewish state, there will not be peace." 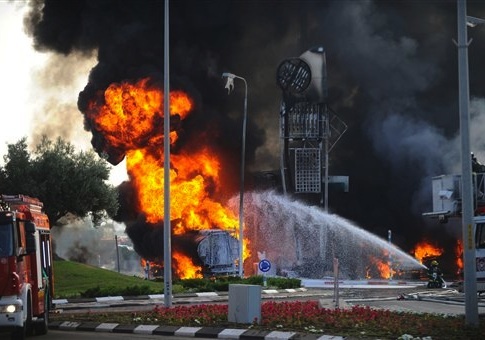 Hamas has bombarded Israel firing more than 450 rockets in recent days, one every ten minutes. "There is no justification for Hamas' violent assault on Israel, which withdrew completely from Gaza in 2005. Since then, Hamas and Palestinian Islamic Jihad have lobbed thousands of rockets into Israel and Hamas staged a coup against the Palestinian Authority, assuming complete control over Gaza and turning it into a den of terrorism," Cantor said. Cantor also said the United States must acknowledge the role Iran is playing in the conflict. The Washington Free Beacon reported Thursday that Iran is providing Hamas with advanced long-range articles. "Just as Iran has fueled sectarian violence and extremist terrorism in Iraq, Syria, and Lebanon, it has long provided Hamas and Palestinian Islamic Jihad with lethal support to aid in their unrelenting war of terror against Israel," Cantor said. "I call on the Obama Administration to dispense with the fantasy that Iranian President Rouhani is a reformer and acknowledge the Iranian regime for what it is: the world's most active state sponsor of terrorism and a driver of regional instability." This entry was posted in National Security and tagged Eric Cantor, Hamas, Iran, Israel. Bookmark the permalink.